Cervantes is a town in Western Australia off Indian Ocean Drive about 198km north-north-west of the state capital, Perth in the Shire of Dandaragan local government area. Start off your visit on the 8th (Mon): get great views at Thirsty Point Lookout. Here are some ideas for day two: explore the wealth of natural beauty at Badgingarra National Park. For reviews, traveler tips, where to stay, and more tourist information, go to the Cervantes vacation planning site . Sydney to Cervantes is an approximately 13-hour combination of flight and bus. You can also drive; or do a combination of bus and train. Traveling from Sydney to Cervantes, you'll gain 2 hours due to the time zone difference. Wrap up your sightseeing on the 10th (Wed) to allow time to drive to Perth. Escape the urban bustle at Rockingham Beach and Matilda Bay Reserve. Kids will appreciate attractions like City Beach and Rio Tinto Naturescape, Kings Park. 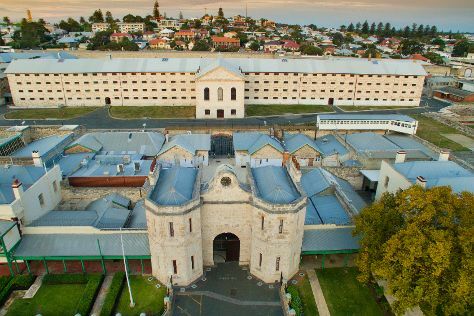 You'll find plenty of places to visit near Perth: Fremantle (Fremantle Prison & Glen Cowans' Studio at the Roundhouse). There's still lots to do: see the interesting displays at Aviation Heritage Museum, steep yourself in history at The Perth Mint, and take in the spiritual surroundings of St. Mary's Cathedral. For reviews, ratings, photos, and other tourist information, go to the Perth online route planner . You can drive from Cervantes to Perth in 2.5 hours. Another option is to take a bus. Expect a daytime high around 21°C in July, and nighttime lows around 8°C. Wrap up your sightseeing by early afternoon on the 14th (Sun) to allow time for the car ride to Bunbury. Deepen your sense of the past at sights like Water wheel and Bunbury Lighthouse Lookout. Step off the beaten path and head to Surfers Point and Margaret River Mouth Beach. Venture out of the city with trips to Eagles Heritage Wildlife Centre (in Margaret River), Christian Fletcher Gallery (in Dunsborough) and Sugarloaf Rock (in Cape Naturaliste). Next up on the itinerary: enjoy the sand and surf at Back Beach and tour the pleasant surroundings at Wyalup-Rocky Point. To see maps, photos, ratings, and tourist information, you can read our Bunbury road trip planning website . You can drive from Perth to Bunbury in 2 hours. Alternatively, you can take a train; or take a bus. Wrap up your sightseeing on the 17th (Wed) early enough to drive to Albany. Kick off your visit on the 18th (Thu): get up close to creatures of the deep with a dolphin and whale watching tour. For other places to visit, where to stay, more things to do, and more tourist information, refer to the Albany day trip site . Drive from Bunbury to Albany in 4.5 hours. Alternatively, you can do a combination of bus and flight; or take a bus. In July, plan for daily highs up to 19°C, and evening lows to 7°C. Wrap up your sightseeing by early afternoon on the 19th (Fri) to allow time for travel back home.